Our lovely friend SK had offered to babysit, so once we’d shown her how to access all the essentials (Netflix, pizza, bakewell tarts…) we were off! LD had settled himself to sleep thankfully so after a celebratory glass of champers we hopped in a cab. 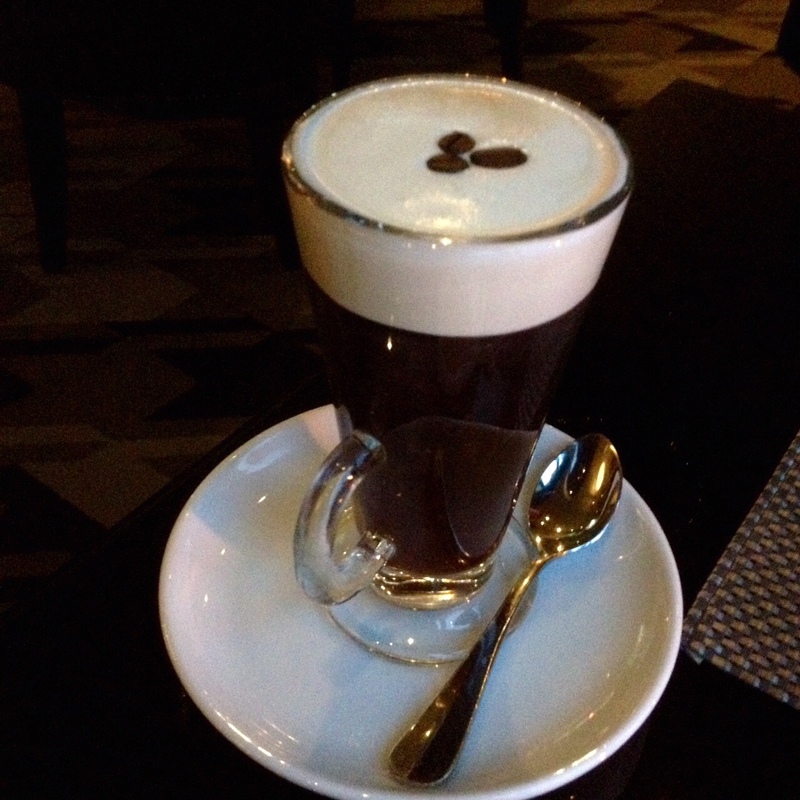 To Cafe 21! We arrived a little early for our table and were asked to have a drink at the bar while our table was prepared. There was a lively vibe at the bar, I think they had a wine pairing evening on so it was buzzing but not packed. We grabbed a couple of bar stools and perused the menus. Pretty confident in the knowledge that we’d be ordering red meat we settled on a carafe of house red to accompany it. The Mr was starting to salivate at the multitude of delicious sounding options on the menu. There was no decision to be made on starters as we knew what we were having; half a dozen Lindisfarne oysters with spicy pork sausages £15.40. “There’s 3 mains I want, it’s too hard to choose” the Mr complained while I sipped on my wine and enjoyed the freedom of being out -without the baby- enjoying adult conversation! It felt pretty good I must admit. Our table ready, we were led through the restaurant by the lovely Jen who it turns out is the cousin of our good friend N! (T – who accompanied me to the burrito challenge‘s husband!) Small world. 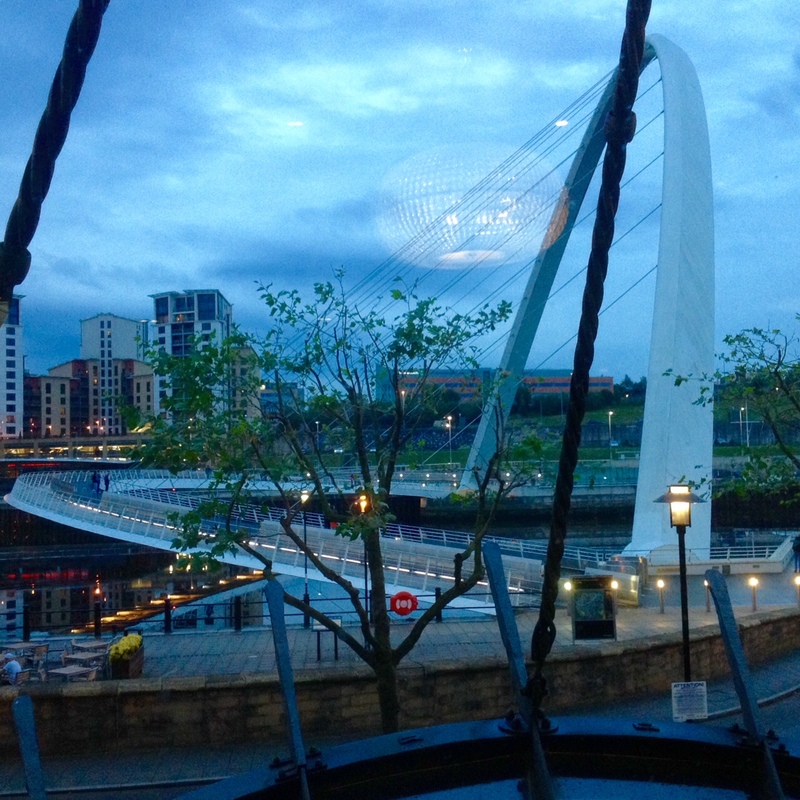 Now if you’ve never heard of the eponymous chef Terry Laybourne’s Cafe 21 on the Newcastle Quayside, the name is slightly misleading. It’s not a cafe, but a beautiful, contemporary bistro – think white tablecloths, leather furnishings, chandeliers, fresh roses and attentive service. 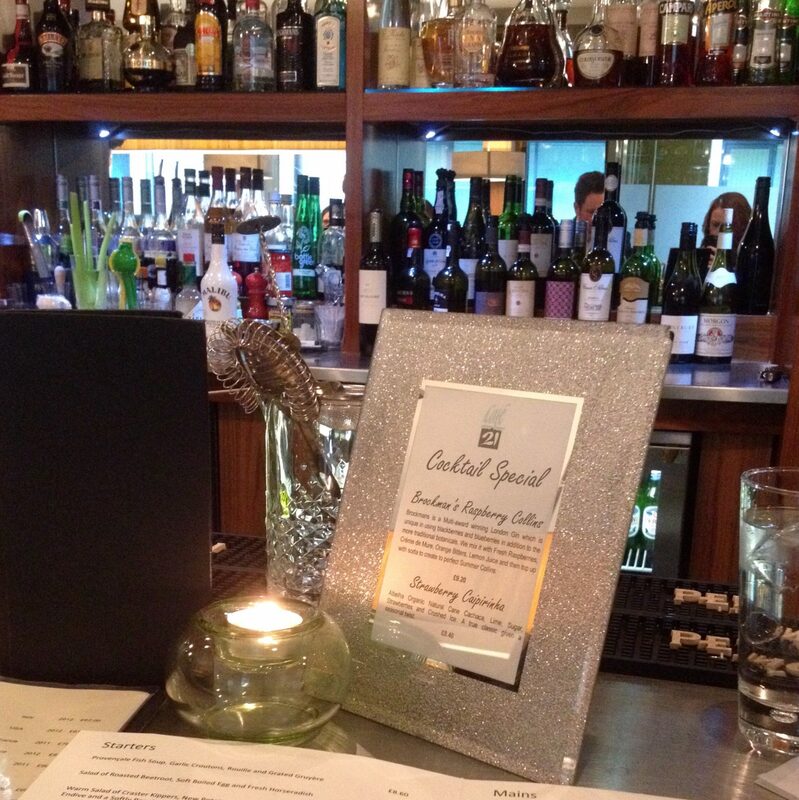 There is no stuffy dress code, the staff are friendly and look after you so well. It’s easy to see why they’ve just won another National Award for service. The Broad Chare, Caffè Vivo, Cafe 21 at Fenwick are all part of the 21 Hospitality Group, and Laybourne had a hand in Jesmond Dene House also (where we happened to be last Saturday for our friends’ wedding). Our order taken, freshly baked sourdough bread & olives were promptly placed on our table (which happened to be the same table we sat on 2 years ago!) they gave us a taste of what was to come; the bread was crunchy on the outside and light and fluffy in the middle – bread perfection. The olives tasted like they had a little anchovy in the middle and were very tasty. Our appetites whetted, the Tabasco sauce and mini oyster cutlery arrived ready for the piece de resistance. Now if you ask me, there is something so beautiful about a plate of freshly shucked local oysters from the Northumbrian coast. 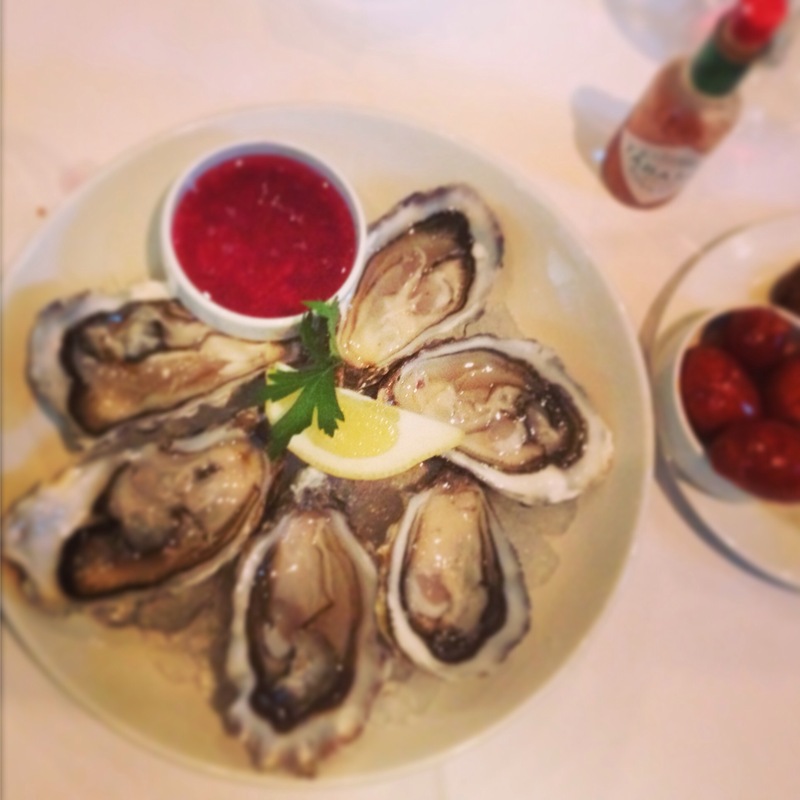 Forget the pearl, give me the fleshy, salty, zingy oyster any day. A squeeze of lemon, dash of tobasco and drizzle of the balsamic & onion vinaigrette that accompanied our seafood and we were ready to knock them back. Too good to swallow in one, I chewed on mine and enjoyed the multitude of flavours, textures and energising after effects it offered. A warm chorizo & Irish wheaten bread chaser offered a complete contrast of flavours. We were both giddy with the Omega 3 hit and ready for round 2. I love the fact that it’s a fun dining experience assembling and sharing the tasty morsels. One tiny flaw, my second oyster had a couple of tiny slivers of shell in it. I don’t know if it was the shucking, or just a naturally occurring anomaly and it didn’t ruin it for me. The third one was perfect so I soon forgot all about it! At this point the Mr nipped to the loo, and upon returning exclaimed “You know you’re in a nice restaurant when the toilets make you feel like you’re in a spa!” Fresh flowers, magazines and hand towels – nice little touches that contribute to the overall attention to detail employed by Laybourne’s team. 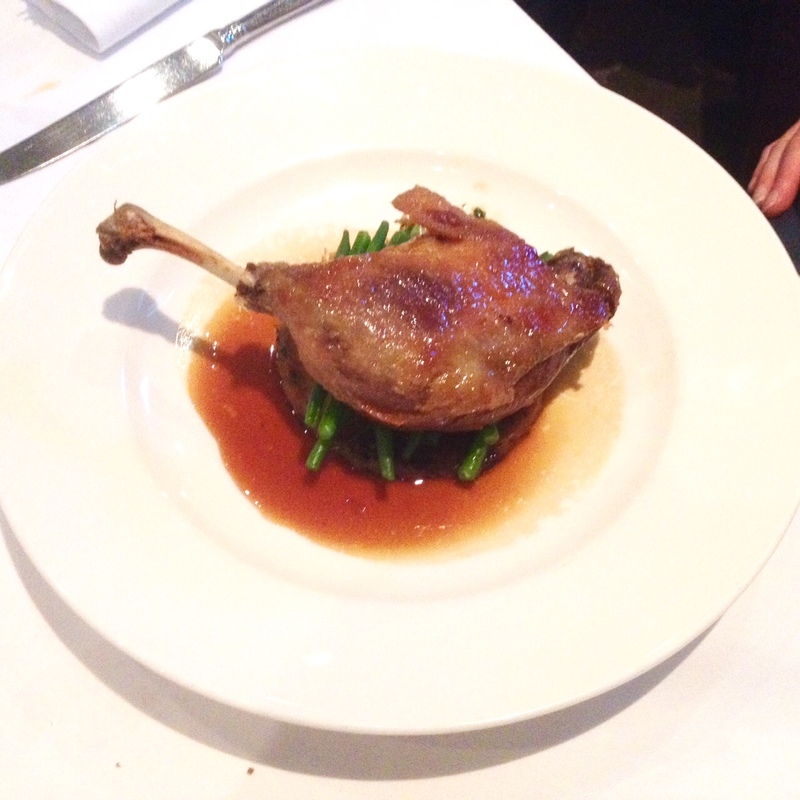 The Mr had settled on the Crisp Confit of Duck, Fine French Beans, Lyonnaise Potatoes – Thyme and Rosemary £19.20. He tucked into the meat which was perfectly tender with crispy skin and the Lyonnaise potatoes were a hit too (sliced pan-fried potatoes and thinly sliced onions, sautéed in butter with parsley). His only complaint was that the duck was a little salty for his liking. He still ate, and enjoyed, it all though! 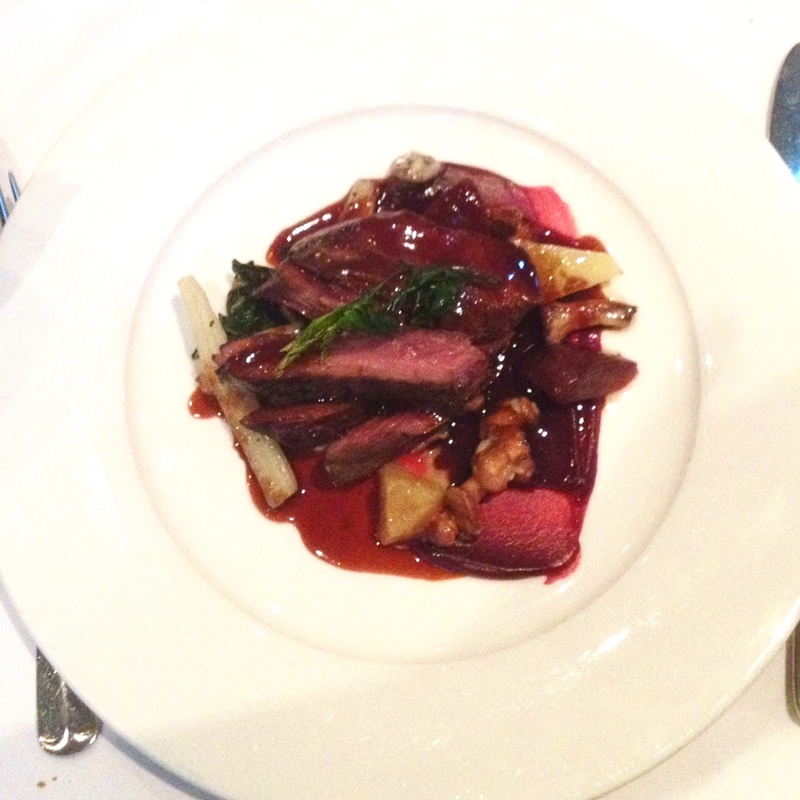 I went for the Roast Northumbrian Venison, Beetroot and Red Chard £21.50. The meat was expertly cooked, pink in the middle with that beautiful dark purple red colour round the outside, sliced and served on a bed of beetroot, chard with a subtly sweet and tangy sauce. It came with German Spätzle egg noodles which were quite the revelation. Tasting like a cross between noodles and polenta they were the perfect accompaniment. We polished off our mains and had a quick chat about our trip to Ireland last year with Cheryl, our friendly (Irish) waitress. We settled up as although it was tempting to have one of their undoubtedly delicious deserts I was keen to follow a tradition my Dad and I started in my student days in Edinburgh – going somewhere else for dessert. 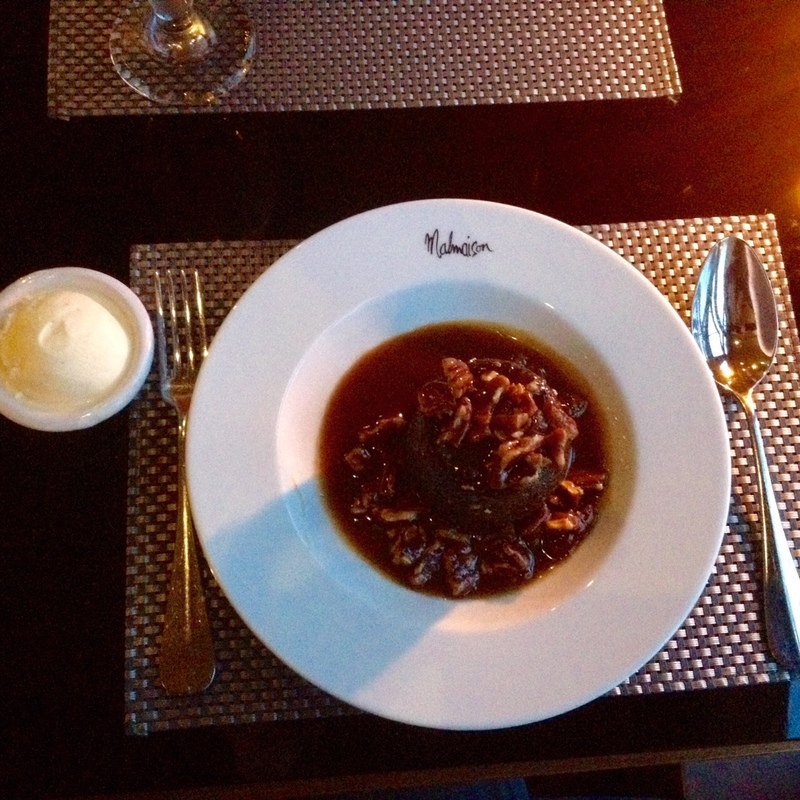 The pud went down a treat – warm, comforting with lots of toffee sauce, pecans and the obligatory dollop of ice cream on the side (two dollops would’ve been ideal, but that wouldn’t fit it in the little side bowl…..!) It was the perfect end to a perfect evening. Not wanting to be too late home for the babysitter we managed to track down our very first Uber (!) which was luckily free of charge due to an introductory offer. Weirdly they are currently charging 1.5 times the amount of a standard fare as they have so few cabs in Newcastle at the moment! This makes little sense to us, but being that we had a code it all went very smoothly and we had a very entertaining driver who regaled us with stories of his other job – training sheepdogs for TV programmes! We got home just as LD was having a little grumble, having being extremely good for SK while we were out. He soon settled thankfully. 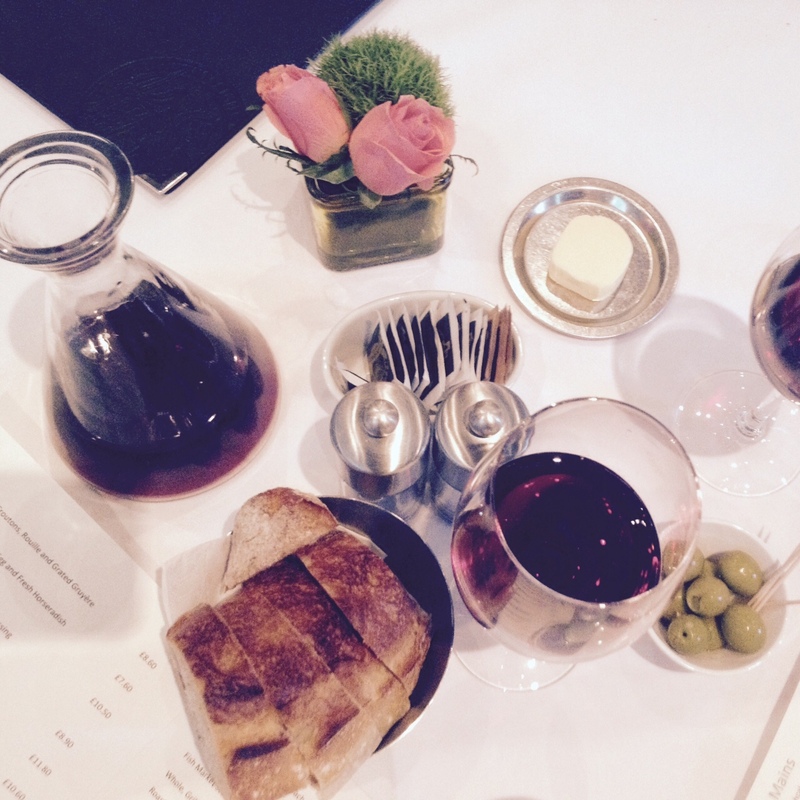 All in all we couldn’t have asked for a better anniversary night out – great food, drinks and conversation! 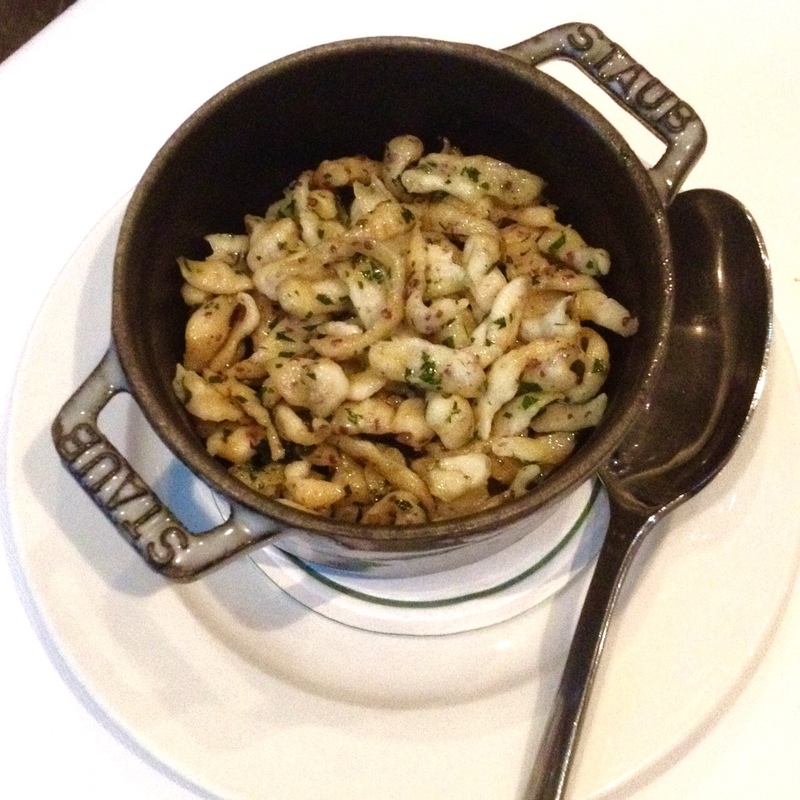 If I could eat those oysters every day I would…. © 2019 Toon Lunch Club. All rights reserved.